Pre-heat oven to 160°C/325°F. Season brisket with salt and pepper. Heat oil in a large, heavy-bottomed pot and briefly brown brisket on all sides. Peel shallots and garlic cloves. Remove brisket from pot. Briefly fry shallots and garlic in remaining fat. Add tomato paste and mustard and briefly sauté. Pour in beer and stock. Add bay leaves and honey and let simmer for approx 2 min. Place meat back in pot and cover with lid. Transfer pan to oven and roast at 160°C/325°F for approx. 2.5 hrs. Remove lid and place back in oven for approx. 30 min. more. Remove brisket form pot, cover with aluminum foil ,and let rest for approx. 15 min. Meanwhile, strain remaining liquid into a saucepan. Mix cornstarch and water to form a slurry, then add to the liquid. Simmer over medium heat until gravy is reduced and thickened to preference. 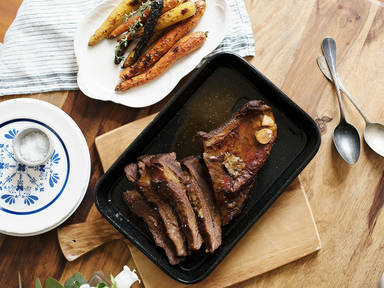 Slice brisket and serve with gravy and roasted vegetables on the side. Enjoy!